Leahanmore is the 756th highest place in Ireland. 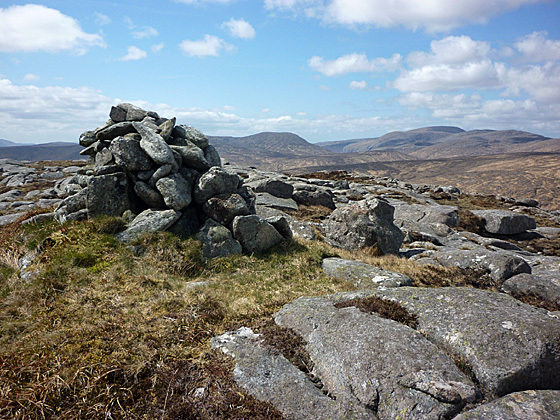 Climbed An Liathin Mor on 3 May 2010 as the third and final day of walking in the Derryveagh/Glendowan Mountains. We took the shuttle bus from the Glenveigh National Park Visitor Centre to the Castle and then walked SW out the lakeside track along Lough Beagh to C0030018800 A where we turned steeply up left on a good track leading into Glenlack. The track soon began to level out and even undulated a little up and down. Eventually the track disappeared as we continued on up towards the head of the Glen to C0027217123 B. Because of the dry weather in recent weeks the going was fairly good but I understand it can be very marshy indeed after a period of rain. From here we headed SE up around the spur of Kinnaveagh to a flat area C0077116775 C C below the W slope of An Liathan More. From here it was a steady climb up to the summit cairn C0178316630 D. The views from the top were far reaching SSW to the Bluestacks N to Inishowen and E to the Sperrins. There was also a fine view SW over the Glendowan Mountains and Slieve Snaght (see photo). The top of this hill ia an excellent vantage point to sit and savour the beauties of NW Donegal. On this occasion we returned by our outward route. However I would also commend a circular route which takes in Kinnavagh and Altachoastia the small ridge of hills along the E side of Lough Beagh. To follow this route go back down from the summit to the coll C0077116775 C C and then head N for Pt 343 C0080017300 E on the southern spur of Kinnaveagh before climbing NNE along the ridge to the top C0142518500 F. There are fine views from this high point on the ridge down NE over Lough Nambraddan and Lough Inshagh. Continue N over Pt 268 C0150019300 G and then down NE to a coll before the short climb up to Altachoastia C0240020225 H. From here a walk down the ridge NE for 1.4k leads to the Gartan Track C0300021500 I. Turn left and after some 200m meet the main access road from the Visitor Centre, turn left and follow along for some 700m to the Castle approx and the Shuttle Bus. A rewarding circuit out to An Liathin Mor.